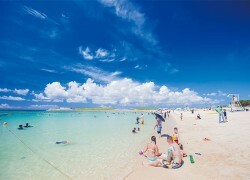 This is an urban-style beach with shallow water located right next to the Okinawa Convention Center. Tropical Beach is popular among locals and tourists alike, and it gets crowded with people relaxing or enjoying a BBQ on weekends. From the beach, you can take in a magnificent view of the sunset.